Scrangie: Tomorrow! Butter London Friends and Family Sale! Heads up! 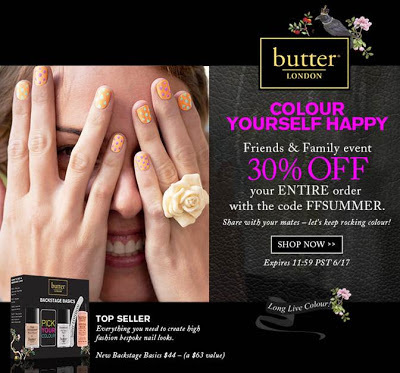 Starting tomorrow through the 17th, you can get 30% off your order at butterlondon.com with code FFSUMMER. Good deal, those things are pricey! My favorites from them are The Black Knight (especially layered with Tart with a Heart), Disco Biscuit (I'd call it a must-have if you like bright jellies), the Melt Away cuticle remover, and the Kitten Heels Powder Finish Foot Creme. I think it has. I actually hated them when I first tried them 3 or 4 years ago, but now I really like them. They are expensive, so if you're unsure you could try buying one or two colors from a place with a good return policy! Ugh, there goes my budget. How often do they have sales like this? I'm not sure if I should buy loads because I have a list of about 10 that I want but that would be a lot of money in one go :( To be honest I haven't followed their website for very long so that's why I'm wondering. I know Nails Inc have good sales (7 for £18 in lucky dip?!) quite often so I rarely buy theirs at full price, mostly just the topcoat. Meh. I've got four Butters already (there's a Butter store in my airport so I grabbed a couple each of the last two times I've flown), and while they do have some lovely colors, between the annoying bottle, the lesser amount of polish and a runny formula on one, I'll go for A England. They're only $10 vs these being $12, even on sale. I will pick up Tart next time I'm there though, I already have Black Knight.